I admit, it’s not that rare of an occurrence to find me standing in the kitchen, leaning over a pot on the stove or tray of food fresh from the oven, sampling it (shoveling it into my mouth), exclaiming how amazing it is, as though I’m surprised: “Oh, wow! This is really good! This isn’t bad at all!” Yeah, I’m still surprised sometimes that I can cook. But I really wasn’t expecting to have such a strong reaction to these parsnip and carrot fries. They took such minimal effort—some peeling and slicing, some drizzling with olive oil and sprinkling of sea salt and cracked black pepper, and a 35 minute nap in the oven. That was it. I daresay they were as satisfying as a true potato French fry. Parsnips are naturally savory and flavorful, and carrots are sweet. They are prime for roasting. My only mistake was not making more—next time, I will definitely make a bigger batch. I quickly pulled together a garlic dip for…dipping. It’s the perfect accompaniment to these fries. Side note: Carrots and parsnips come in a variety of sizes—look for ones that are good-sized, not too skinny. Peel your carrots and parsnips. Then, slice in thin strips—like cutting potatoes into French fries. 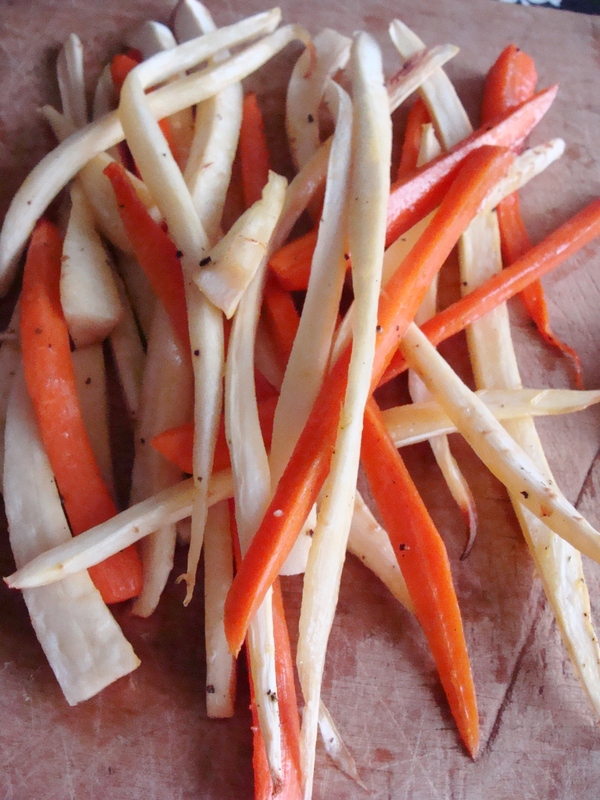 Lay out the sliced carrots and parsnips on a non-stick baking sheet. Drizzle with olive oil and toss to coat. Then season with sea salt and black pepper. Bake the carrot and parsnip fries for 35 minutes, flipping them at least once. While the fries are baking, make your garlic dip! Peel and mince 2 cloves of garlic. In a small bowl, combine your sour cream, mayo, lemon juice, and minced garlic. Season to taste with additional sea salt and black pepper. 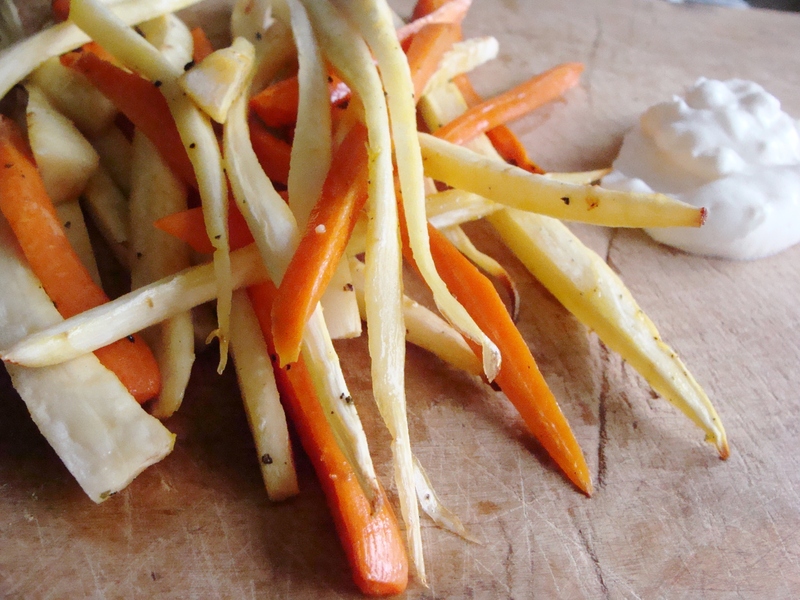 Serve the roasted carrot and parsnip fries with the dip as an appetizer or a snack. They’d also make a nice side dish for chicken or steak. French fries that are good for you—I’m all for it! « roasted harvest veggie bowls with sweet avocado. 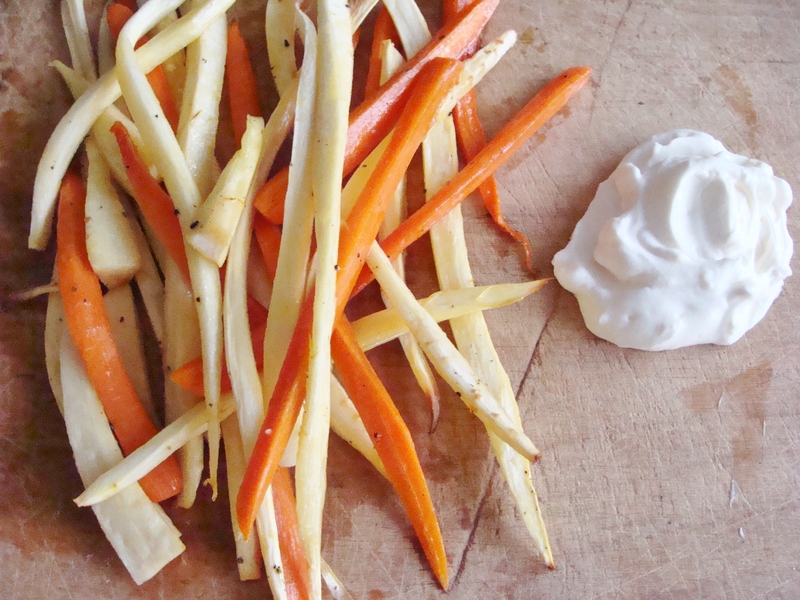 You are currently reading roasted carrot and parsnip fries with garlic dip. at The Cheesy Kitchen.